The answers to some common questions are here in this FAQ. However, if there's something I've missed, please feel free to either email or call (240-396-6831) and I will do my best to answer your questions! Thank you! What are the ingredients in your shaving soap? The use of animal products is a controversial subject for many. While most of my soaps are vegan or vegetarian, the main ingredient in my shaving soap is tallow, an animal fat. This sought after ingredient for traditional shaving soaps is a by-product when beef are killed for food. I add organic unrefined shea nut butter, castor oil, palm oil, avocado oil and stearic acid along with extra glycerin, bentonite clay, aloe vera leaf juice and cruelty-free Tussah silk. I'm sorry but I don't make a vegan version at this time. Is your soap good for sensitive skin? I have had many customers comment on the excellent skin feel that this soap leaves after the shave. The lather is thick, slick and protective. I formulated it without coconut oil on purpose, because it can be drying for some people when made into soap. I include pure aloe vera gel which is soothing to irritated skin. The unscented version is the best one to choose if you have really sensitive skin: it is infused with organic Calendula flowers and has added allantoin and sea buckthorn oil. However, you should always check the ingredients of any new product to make sure there is nothing to which you are allergic. And, some of the oils may be produced in facilities that also process nuts so I can’t guarantee that there might not be traces of peanut or other nut oils – please do a patch test if in doubt. How big is your soap and how is it packaged? The soap is molded into 3” diameter pucks that weigh between 4 and 4.5 ounces each, and comes either in a plastic travel tub, shrink-wrapped as a refill, or as a 2 ounce shave stick. No, it is not a hard triple-milled soap, but rather a soft, Italian-style soap which has the consistency of putty. Hand-made artisan soap cannot be milled because it contains a large amount of glycerin that would gum up the milling rollers. The truth is, triple-milling is not necessarily, by itself, an indicator of soap quality. Is your shaving soap a glycerin soap? What most people call glycerin soap is “melt & pour” to soap makers: a prepared soap or detergent base clarified with sugar and alcohol that the artisan can melt, scent, and pour into molds. We do not use melt & pour: Mystic Water soap is made the old-fashioned way from scratch, using excellent ingredients: tallow, shea butter, oils and natural additives to enhance its performance. All soap making produces some glycerin as a natural by-product of the chemical reaction between oils and lye, but we add extra vegetable glycerin to make your lather even more moisturizing. 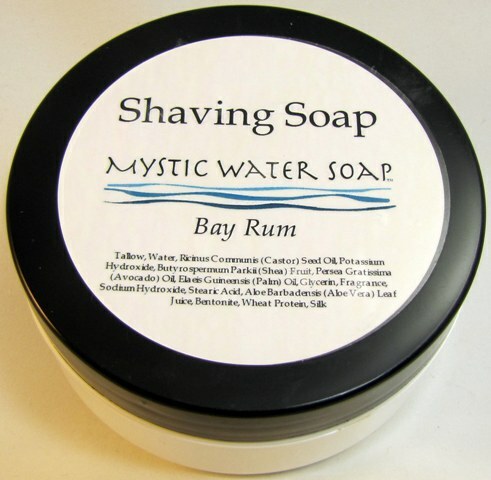 So in a certain sense, Mystic Water can also be considered a “glycerin” soap. Can I add my own fragrance to your unscented soap? Yes, you can scent my unscented soap if you like. First, cut it into very small pieces and put them into a Pyrex measuring cup with about one tablespoon of distilled water. Cover the top of the cup with plastic wrap and microwave it in short bursts of decreasing length, i.e. 30 seconds, then 20, then 10, etc. As it begins to melt, keep a close eye on it - if the volume of the soap suddenly starts to rise towards the top of the container, stop the microwave, take the container out and carefully peel off the plastic wrap (watching out for hot steam! ), stir the soap with a tiny whisk or a fork and then cover it and microwave it again until it's as soft as pudding. It usually foams up a couple of times during the process - just stir it back down but don't overcook it. When it is soft you can add your skin safe cosmetic grade fragrance oils or essential oils (please do your research first because not all essential oils are safe to use). Generally, for one puck of soap, you should use no more than half a teaspoon of fragrance. Do not use aftershave or cologne which contains alcohol. Then spoon the soap into your container and let it cool. What kind of brush works best? It’s a matter of personal preference: some people get good results with a soft badger brush and others prefer a slightly stiffer brush. There are also very good synthetic brushes available. 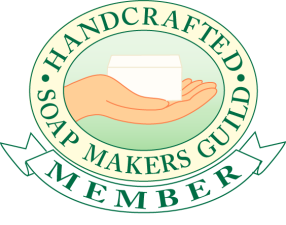 There are videos on YouTube that can help you learn to build lather with my soap. Yes, the samples of soaps I have for sale can be purchased 3 for $3.50 or 6 for $7 plus $3.50 postage. Each sample weighs about .5 oz., enough for many shaves. This offer is available only on my website for men, on the "Samples" page, here. Where can I buy your shaving soaps? I have a website devoted to my products for men - that is where you can buy all of my shaving soaps, shaving sticks, and samples. The site is http://Mystic4Men.com.